Draftstars Biggest Bash The Right Concept For "Clangers"
In our latest Draftstars Biggest Bash Qualifier interview, we speak to DFS regular Andrew Cottman, better known as "Clangers", about his qualifying win and his plans for the final! BBL08 will see the rematch of the BBL07 Grand Final on Monday night, with the reigning premiers the Adelaide Strikers hosting the Hobart Hurricanes at the Adelaide Oval. Check out our favourite fantasy plays in our regular preview! BBL08 returns to Sydney on Sunday night with the Sydney Sixers hosting the Brisbane Heat at the SCG. Check out our cheat sheet featuring projections and recent form and have a read of our favourite fantasy plays! 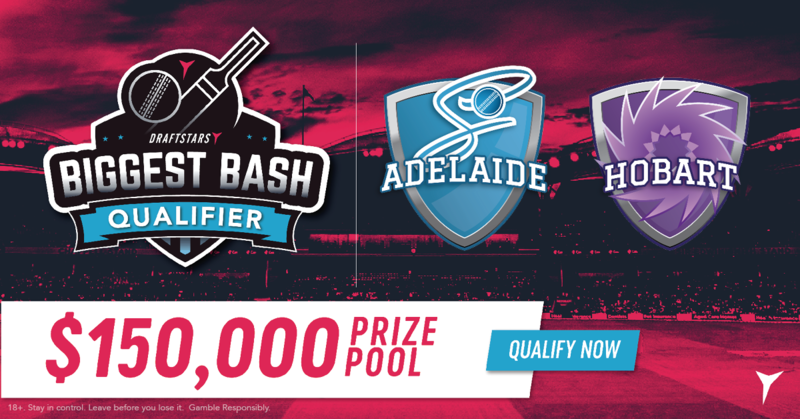 The second Melbourne Derby of BBL08 takes place on Saturday night with the Melbourne Renegades hosting the Melbourne Stars at Marvel Stadium at Docklands. Check out our preview for our cheat sheet and favourite fantasy plays! BBL08 action heads out west with the Perth Scorchers hosting the Hobart Hurricanes at Optus Stadium. Before you build your DFS lineups check out our preview with our cheat sheet and favourite fantasy tips! The third and deciding One Dayer will take place on Friday at the MCG. Australia got a shock win in Game 1 before India levelled the series in Game 2. Who will come out on top to win the series? Rain Dance Books Draftstars Biggest Bash Seat For "Milanos1987"
The name "Milanos1987" has been featuring all over Draftstars leaderboards in recent times and Adam joins us to talk us through his recent Draftstars Biggest Bash Qualifier win! BBL08 returns to the Gabba on Thursday night where the Brisbane Heat will look to continue their good form against the Sydney Thunder. With another Biggest Bash qualifier on offer, check out our preview for our cheat sheet and favourite fantasy plays! BBL08 returns to Sydney on Wednesday night with the Sydney Sixers hosting the Melbourne Renegades at the SCG. Check out our cheat sheet on the match as well as our favourite plays at a range of different salaries! Accountant by day, Big Bash expert by night - Draftstars Biggest Bash qualifier winner "Brento" shares the story of his win with us as we look towards the $150,000 VIP Live Final on February 17!